Ernestine Wiedenbach was born in 1900 in Hamburg, Germany, and her family moved to New York in 1909. She earned a Bachelor of Arts from Wellesley College in 1922 and her Registered Nurse's license from the John Hopkins School of Nursing in 1925. She got her Masters of Arts from Teachers College, Columbia University in 1934. In 1946, Wiedenbach earned a certificate in nurse-midwifery from the Maternity Center Association School for Nurse-Midwives in New York, and taught there until 1951. In 1952, she joined the faculty of Yale University as an instructor in maternity nursing. She became an assistant professor of obstetric nursing in 1954. When the Yale School of Nursing established a master's degree program, she became an associate professor and was the director of the major in maternal and newborn health nursing. She published Family-Centered Maternity Nursing in 1958 and Communication: Key to Effective Nursing (128p) in 1982. Wiedenbach died in 1998. 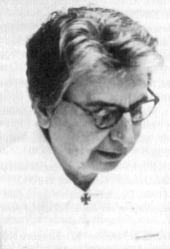 Ernestine Wiedenbach developed the conceptual model of nursing called the Helping Art of Clinical Nursing, which was influenced by the works of Ida Orlando. In her model of nursing, she explains that nursing is the practice of identification of a patient's need for help through the observation of presenting behaviors and symptoms, exploration of the meaning of those symptoms with the patient, determining the cause of discomfort, and determining the patient's ability to resolve the discomfort or if the patient has a need for help from the nurse or other health care professionals. The goal of nursing consists primarily of identifying a patient's need for help. The need for help is defined as "any measure desired by the patient that has the potential to restore or extend the ability to cope with various life situations that affect health and wellness." Need-for-help must be based on the individual patient's perception of his or her own situation. Wiedenbach's theory identifies the patient as "any individual who is receiving help of some kind, be it care, instruction or advice from a member of the health profession or from a worker in the field of health." A patient is any person who has entered the healthcare system and is receiving help, which means he or she does not need to be ill. A person receiving health-related education would qualify as a patient. The theory identifies four main elements in clinical nursing: a philosophy, a purpose, a practice, and the art. The nurse's philosophy is his or her attitude and belief about life, and how that affects reality for him or her. The three essential components Wiedenbach associated with a nursing philosophy are reverence for life; respect for the dignity, worth, autonomy, and individuality of each human being; and the resolution to act on personally and professionally held beliefs. The nurse's purpose is that which the nurse wants to accomplish through her actions. It encompasses all of the activities directed toward the overall good of the patient. The practice of nursing consists of the observable nursing actions affected by beliefs and feelings about meeting the patient's need for help. The art of nursing includes understanding the patient's needs, developing goals and actions intended to enhance the patient's ability, and directing the activities related to the medical plan to improve the patient's condition. The nurse's focus is also on the prevention of complications related to reoccurrence or the development of new concerns. Nursing skills are carried out to achieve a specific patient-centered purpose rather than the completion of the skill itself being the end goal. Skills are made up of a variety of actions, and characterized by harmony of movement, precision, and effective use of self. The theory explains that knowledge encompasses all that has been perceived and grasped by the human mind. It may be factual, speculative, or practical. A nurse uses two types of judgment in dealing with patients: clinical and sound. Clinical judgment represents the nurse's likeliness to make sound decisions, which are based on differentiating fact from assumption and relating them to cause and effect. Sound judgment is the result of disciplined functioning of mind and emotions, and improves with expanded knowledge and increased clarity of professional purpose. The central purpose which the practitioner recognizes as essential to the particular discipline. The prescription for the fulfillment of the central purpose. The realities in the immediate situation that influence the central purpose.